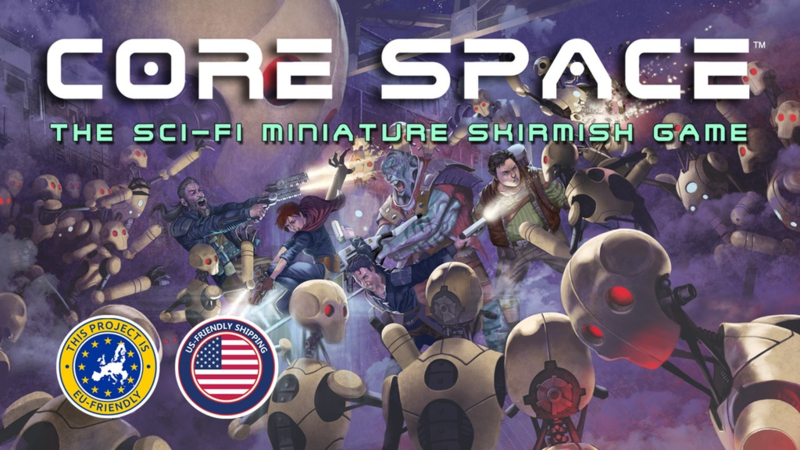 Core Space is the new sci-fi skirmish game from Battle Systems, which is currently funding on Kickstarter. Battle Systems have previously run four very successful kickstarter campaigns to produced ranges of their excellent card scenery sets for sci-fi, fantasy and post-apocalyptic settings. This time around they are once again offering a set of sci-fi scenery, but this time it’s one of the key components in a skirmish game. Given that terrain is a major part of many miniatures games, this seemed the natural next step for Battle Systems, and whilst offering terrain as part of a sci-fi skirmish game is nothing new, since this terrain is card rather than plastic, MDF or resin, you tend to get more for your money. Whilst card terrain is most definitely at the budget end of the market, the Battle Systems product is actually very good – and thus makes putting together large corridor systems (much loved by sci-fi gamers and fantasy dungeon crawlers alike) very affordable. The Core Space kickstarter campaign was launched with a set of beta-rules already available for download – the theme of the game appears to be freelance freighter crews attempting missions in order to try and make a living whilst keeping their spacecraft in a fit state to fly – this isn’t likely to be a theme that appeals at all, is it? I must admit that the one aspect of the game that doesn’t appeal is ‘The Purge’ – these are the ‘bad guys’ of Core Space, and seem to act rather like a timing mechanism in the game. It’s not the whole ‘automaton race’ thing so much as the design, which has far too much of a ‘Will Smith I Robot’ vibe for my liking. In addition to the base game, their previous 2nd generation sci-fi scenery sets are also available as add-ons – which make this campaign well worth a look. The only downside I can see is this – it’s yet another small gang-style sci-fi skirmish game in a market that has a host of these. Plus it’s launching just at the time when one of the classic games of the genre – Necromunda – is reappearing in stores. My only hope is that the game is sufficiently different to retain and grow its identity in what is a crowded marketplace.